To make your wedding photographs as beautiful as possible, why not coordinate your bridal dress, bridesmaid dresses, and flower girl dresses? Recently, supermodel Kate Moss wed rock musician Jamie Hince (of The Kills), and she wore an ivory, 1930′s-style Galliano couture wedding gown with metallic accents. To coordinate her wedding party, Kate chose innocent white gowns for her bridesmaids and flower girls, along with laurels of flowers for their hair. Although choosing white bridesmaids gowns isn’t a typical choice, it gave the wedding photos a dreamy, innocent quality. Kate Moss wanted a decadent, Great Gatsby vibe for her nuptials, and she succeeded brilliantly…right down to her groom’s fitted, pale-blue tuxedo! To find the right combinations for your wedding, we’ve put together some exciting wedding party ensembles that may give you some welcome wedding inspiration. 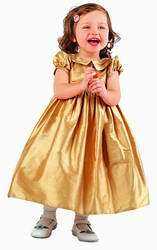 Gold adds a touch of sunlit beauty to wedding party ensembles…from the bride’s stunning white wedding dress, to the bridesmaids evening dresses and the flower girl’s little frocks. If you love a touch of metallic glamor, coordinate your wedding party with combinations of cream, gold and white..